Whether you are a small one person operation or a large corporation, correspondence is important. The correspondence has a very powerful impact on the business and its image. Don’t risk losing clients because of shabby looking letterheads or business cards. Instead, download the business letterhead template and start producing professional quality letterheads that rival the best. Use the letterhead and matching business card template for a small business or personal stationary. 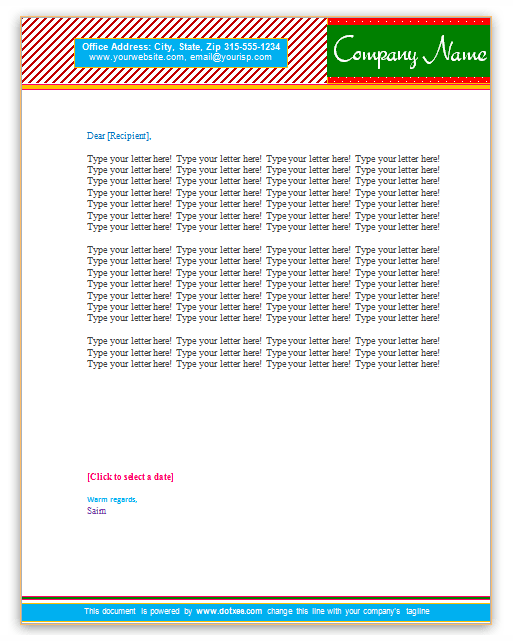 This is a fully customizable letterhead template. It is easy to customize the colors, themes, and fonts in Microsoft Word®. Here are the features of this letterhead template. There is a separate section for your company name. You might wish to add a company logo in this area. There is a section for the company physical address, email address, and website. Redesign this section. Add as much or as little information as required. Next is the salutation section. Change it to something more personable or formal. The body section is next. Make that section as long or short as desired. The closing section is also very customizable. Add a different closing and your personal signature. This easy to customize letterhead template will make it easy for you to compose a professional looking and well designed letterheads that enhance your company image.